Earthbag Technology: Simple, Safe and Sustainable by Dr. Owen Geiger and Kateryna Zemskova published in the June, 2016 Nepal Engineers' Association Technical Journal focused on the 2015 Earthquakes in Nepal. Earthbag Building by Kelly Hart, a review of the book Earthbag Building: The Tools, Tricks and Techniques by Kaki Hunter and Donald Kiffmeyer. Why We Build with Earthbags by Kaki Hunter and Doni Kiffmeyer. Earthbag Advantages Over Other Earth Building Methods by Dr. Owen Geiger compares various factors in a chart. Building with Earthbags by Joseph F. Kennedy outlines the history and use of eathbags for construction in 1997 when it was written. How Earthbag Homes Work is a 6-page article published by HowStuffWorks.com outlining the basics of earthbag construction, based on a variety of internet resources, including this site. Building with Pumice by Klaus Grasser and Gernot Minke, 1990. Reproduced is the fifth and final chapter of this book which is titled "Building with Unbonded Pumice." The History of Beehive-Shaped Homes chronicles man's earliest use of this form to the present. The Systems Dynamics of Earth Building by Rob Wainwright compares the building of an earthbag dome with permaculture principles. Eccentric Aesthetics: DIY Eco-Friendly Earthbag Homes discusses earthbag aesthetics. Earthbag Building Method describes the CalEarth "Superadobe" approach to building. How to build a small earthbag dome made by Kelly and Rosana Hart is described in text and pictures. This three part series of pages gives enough information to actually try building something similar yourself. Step by Step Earthbag Construction by Dr. Owen Geiger describes in pictures and words the eight basic steps of building vertical walls with earthbags, using text, photos and videos. Hyperadobe Step-by-Step describes how to build with net bags or tubing, an innovation of Fernando Pacheco, a Brazilian engineer. Soil Tests for Earthbag by Patti Stouter goes into detailed description of how to evaluate soils. A Manual for Building an Earthbag Shelter by Akio Inoue shows the very basic concepts. Low-cost Multipurpose Minibuilding Made With Earthbags an extensive article by Owen Geiger about how he built a small earth-sheltered earthbag dome. Earthbag Building in the Humid Tropics: Simple Instructions, by Patti Stouter, 2008 is a step-by-step PDF guide that covers materials, layouts, and general instructions for building with earthbags. Earthbags, published by the Madhavi Kapur Foundation in India, is a 33 page, hand-written and illustrated PDF booklet about how to build with earthbags, based on material gleaned from a variety of internet sources, including this site. How to Make a Simple Arch Form using PVC pipe. 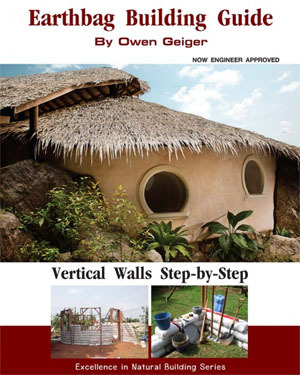 How to Build an Insualted Earthbag Home is an updated PDF version of the above article by Owen. How to Build an Earthbag Roundhouse is a PDF by Owen Geiger that was posted at www.instructables.com, complete with reader comments. Earthbag Technology - Simple, Safe and Sustainable Dr. Owen Geiger and Kateryna Zemskova prepared this for goodearthnepal.org and the government of Nepal to point out the advantages of earthbag building for reconstructing that earthquake torn country. Simple Earth Buildings for the Humid Tropics by Patti Stouter, 2008 is a 17 page PDF doucment which provides some basic ideas for simple houses that can be built of earthbags. Examples of different styles of piers and roofs and windows are shown to help you understand the options available. The Sustainable Living Center Foundation describes the use of an earthbag grade beam foundation. Using Earthbags as Ceiling Insulation describes the use of earthbags filled with a variety of natural insulating materials to insulate roofs and then covering these with natrual fiber mats for the finish ceiling material. Sustainable Characteristics of Earthbag Housing by Brooke Barnes, Mihyun Kang, and Huantian Cao was published in the Housing and Society Journal in 2006. This article evaluates the earthbag house that Kelly Hart designed and built according to the LEED standards. Handbook for Building Homes of Earth, published by the Peace Corps, 1981. This PDF reprint covers a variety of earthen building techniques, including adobe blocks, compressed earth blocks, and rammed earth. It also discusses appropriate roofs, foundations and surface coatings. Automated Earthbag Filling Machineby Dr. Owen Geiger. Originally designed for flood control projects, the bag filling machine has enormous potential for changing the future of earthbag building. Sandbag Machines by Dr. Owen Geiger Here's a sampling of some of the sandbag filling machines currently available. How to Equip Earthbag Walls with Windows shows one way to frame and install sliding windows. Insulated Earthbag/Geotextile Basement Walls by Owen Geiger for the Mother Earth News Blog. Earthbag Building in Cold Climates by Dr. Owen Geiger. Insulated Foudations for Yurts is a PDF by Owen Geiger. Rebuilding efforts in Nepal continue: Earthbag building proves a promising building method for redevelopment is a PDF by Kathryn Kaspar. Rebuilding Nepal, One Earthbag at a Time reviews this short Kindle book. Earthbag Building in Nepal is an article published in The Owner Builder Magazine by Mark Clayton about his work in helping to rebuild housing in Nepal using earthbags. The Earthbag Architecture of Akio Inoue by Kelly Hart, describes some of the work of Japanese professor Akio Inoue. The Honey House by Kaki Hunter and Doni Kiffmeyer describes how they built a small earthbag dome. Tatu Penrith's Sandbag Hideaway is a haven on top of the world and an appealing terracotta and green house with thick walls that give it an earthy, handmade look. The Alison Kennedy House in Moab, Utah is the first permitted earthbag house in Utah. Described by Kaki Hunter and Doni Kiffmeyer. The Sand Castle: Steve and Carol Escott built a two story home on the remote island of Rum Cay, Bahamas, assisted by Kaki Hunter and Doni Kiffmeyer. The Earthbag House May Solve Filipino's Problems ...the Earthbag Construction System is proving to be fast, inexpensive, sturdy and environmentally friendly. It also does not require an army of professionals to build – just eager, willing and able people of both sexes and all ages. Earthbag Construction Maximizes Flexibility A new Bureau of Land Management (BLM) permitting station in Bluff, Utah, provides a strong conservation message to boaters in advance of any trip on the San Juan River. OM Dome: Trevor Lytle Interview with Owen Geiger describes Trevor's involvement in building a Sound Temple in Thailand. It's in the Bag: Earthbag Construction in Poland from Permaculture UK Magazine. The Sandbag Shelters of Nader Khalili describes the work of Nader Khalili and CalEarth in introducing his Superadobe concept around the world. Staff Housing for Twin Streams Environmental Education Center-Mtunzini is a PDF file describing a unique approach to building large, vertical wall structures without buttressing, that utilize simple lattice frames to help support the walls. Eco-Beam and Sandbag Homes explains more about the building system described above. Site Specific: The highly visible art of Nobuho Nagasawa profiles the artwork of Japanese artist Nobuho Nagasawa, which includes many large sandbag structures. A Rice Hull Studio describes a writing sudio made from earthbags filled with rice hulls. Building an earthbag dome describes hows a 4 meter diameter dome was built at a sustainability education center in Australia. The Beauty of Earthbag Homes primarily features aspects of the Hart's earthbag/papercrete Home. The Rocket & the Rabbithole is an enjoyable PDF slide show about making two earthbag school rooms in India. The Mlambe Project is a school in Malawi, Africa. Emergency Earthbag Shelter Proposal, by Dr. Owen Geiger and Patti Stouter, ASLA. The building concept outlined here consists of sandbag (earthbag) walls filled with sand or soil from the site, and tarps for roofing. Post-Tsunami Affordable Housing Project by Dr. Owen Geiger, decribes his concept for an earthbag home for use in the tsunami-impacted region of Southeast Asia. The First Aid Earthquake House is made out of very simple materials: sand bags, rope lines, tape and available insulation materials. The construction process begins with filling the sand bags with fine and heavy materials, where this is possible. The house is designed in such a way that people can construct this facility themselves. Hence, we offer a materials kit and clear instructions of how to build this shelter.